Has Your Naturally Frizzy Hair Taken Over? You see, humidity or moisture in the air only aggravates the issue, but doesn’t cause it. Our hair is truly a complex structure of three unique layers and countless cells. Understanding this structure helps us to understand why frizzy hair happens. This post contains some affiliate links for your convenience, read the full disclosure policy. 1. The first layer, known as the medulla is a loosely packed, chaotic area near the center of the hair. 2. The second layer of hair is the cortex that contains most of the fiber mass. It is mostly made up of structural lipids and keratin proteins. 3. Lastly, the third layer of hair which is the outer layer is called the cuticle. And it is one you are more likely familiar with, as we often talk or read about the hair cuticles. This layer is surprisingly made up of dead overlapping cells that form together to protect your hair. 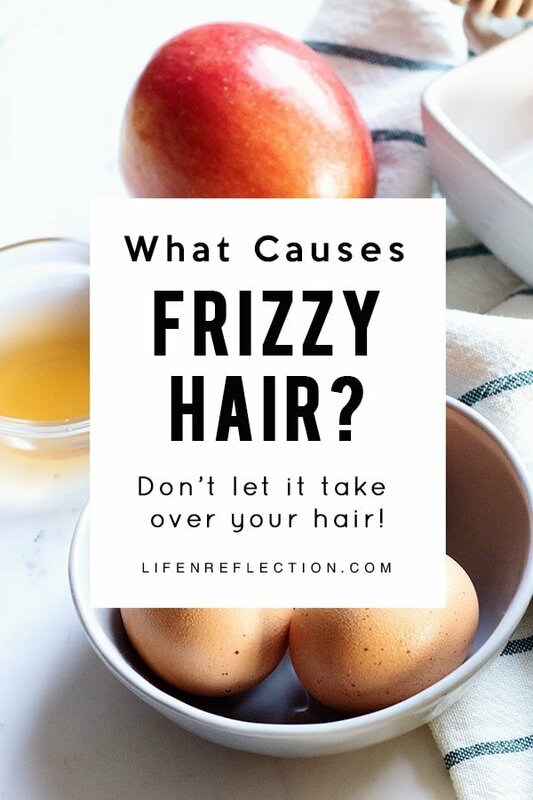 Frizzy hair occurs when the third layer, a.k.a. cuticle of your hair is raised instead of smooth and flat. Why would your hair cuticles raise? Lack of moisture or loss of moisture. Cuticles literally lift up to absorb moisture in the air. Explains a lot right? And a raised cuticle allows moisture to pass through, swelling the strands. Thus causing your hair to appear frizzy and dry instead of defined or smooth. Simply put, frizzy hair is caused by the inability of your hair to retain moisture. 1. Does your shampoo contain chemicals that strip your hair of its protein and natural oils? Such as polyethylene glycol and sodium chloride both used as a thickener in shampoo. Both not only strip your hair of moisture but can cause dry, itchy scalp and hair loss. And sodium lauryl sulfate used for its foaming power breaks down the protein in your hair among other issues. Search the EWG’s Skin Deep Database to review the ingredients in your shampoo and learn more. 2. Drink Much? Is your body dehydrated? If you’re not drinking enough water, it shows! Read about the effects of not drinking enough water and quick tips to overcome it at Just Plain Living. 3. Are you washing your hair too much? Over-shampooing your hair can cause the natural oil your scalp secretes to not get where it needs to go. 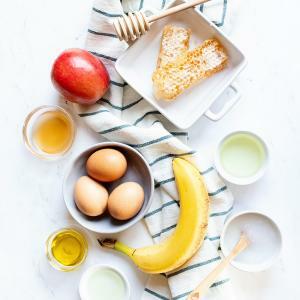 Try washing every other day or alternate with a DIY dry shampoo spray and rinse aids in this natural hair recipes below. 4. Are you coloring your hair with high-lift dye or bleach? Both can severely damage hair cuticles. Talk to your stylist about using plant-based solutions or color less often. 5. Does your conditioner lack ingredients to penetrate the hair shaft and moisturize? Grab my natural hair conditioner recipe made with shea butter here and keep reading to learn what natural oils are most effective for frizzy hair. So, we talked about how the loss of moisture is the cause of frizzy hair. Now, let’s talk about how to prevent frizz and retain moisture in your hair. There are a multitude of natural oils out there, but I’ve found just a handful work best for natural hair remedies. Each helps prevent hair damage, moisturizes even the driest hair, and smooths out frizz. Add these natural oils to your frizzy fighting regimen! High in essential fatty acids and loaded with antioxidants argan oil is one of my natural beauty staples. It seals the hair cuticle and protects against elements such as humidity. Soften and strengthen hair with sweet almond oil containing vitamin E, A, and Omega-3 essential fatty acids. Recommend for leave-in conditioners and homemade shine enhancers due to its lightweight texture. Small enough to penetrate strands, olive oil pulls in moisture to the hair shaft and promotes growth with high levels of vitamin E and antioxidants. And like sweet almond oil, it is a natural emollient with softening benefits to smooth frizzy hair according to the Journal of Cosmetic Science*. 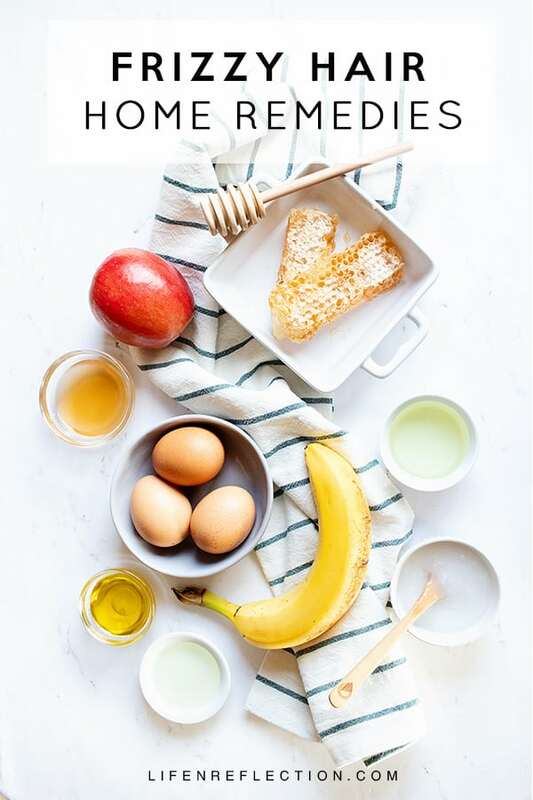 Don’t miss the printables, checklists, and reference guides to help you on your natural living journey in the Life-n-Reflection Resource Library. Easily penetrate the hair shaft and moisture to keep hair hydrated with coconut oil. And prevent frizz by using it a hot oil treatment or hair mask in the recipes below. Brimming with vitamins A, B, C, and E avocado oil provides nourishment to hair. This includes essential fatty acids and the ability to penetrate the hair shaft and combat frizzy hair. Also known as apricot seed oil, it is grown in northern areas of the U.S., Australia, and India. The oil extract from the kernel helps to keep the scalp moisturized and promotes hair growth due to the high content of Vitamin E (Barve and Dighe 2016). It has been shown to be an excellent remedy for damaged and chemically treated hair. Apricot oil makes hair soft and manageable. 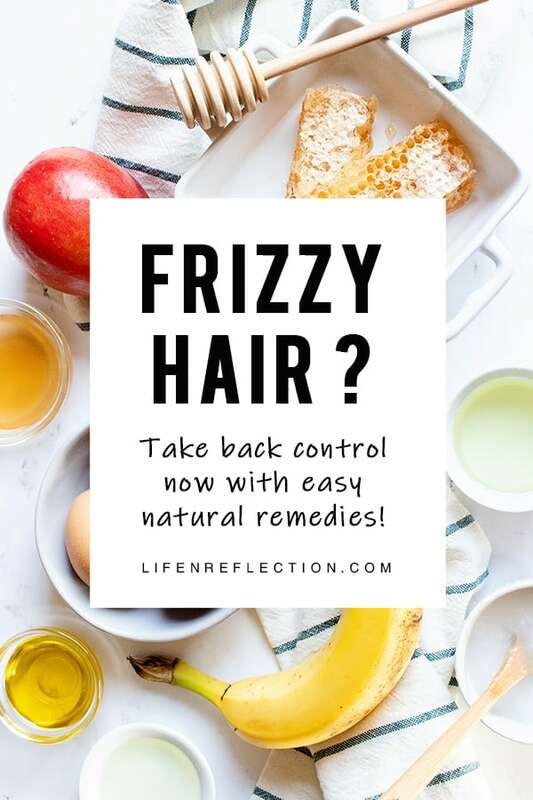 While regular conditioning is helpful to tame frizzy hair there are far more remedies to not only smooth the outer layer of hair but repair it for healthy growth. Applying any of the following frizzy hair DIY treatments can improve shine and make it more manageable. Smooth and soften frizzy hair with an almond banana hair mask. Almond oil locks in moisture and banana soften the hair. Slice one medium banana in half and place in a small bowl. Mash the banana and add one teaspoon of sweet almond oil and blend together with a fork. Massage the almond banana mask into hair, starting at the ends and work your way up. Twist hair up into a bun and allow to sit for 30 minutes. Remove hair from the bun and wash as usual. Coconut oil a great moisturizer for hair can be applied alone as a hot oil treatment. But, if you add honey and essentials oils too you’ll have an incredible frizzy hair remedy! 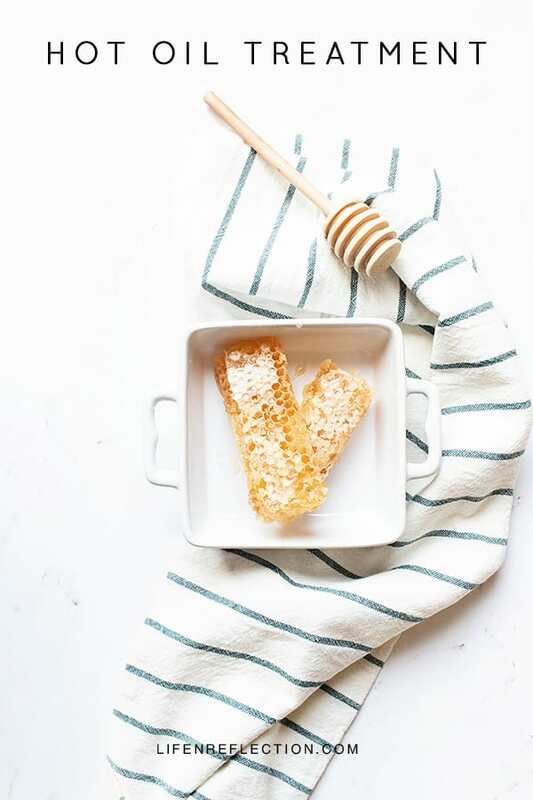 In a small dish combine two tablespoons of coconut oil with one teaspoon of honey. Add two drops each of lavender and rosemary essential oils. Massage the honey coconut oil mixture into your hair and scalp. Wrap with a warm towel and let apply for twenty minutes before washing as usual. I can personally vouch for the calming effect of a cold water rinse on frizzy hair. When shampooing your hair use warm water to open up pores and exfoliate while ridding your scalp of buildup. Then apply your regular conditioner, like this DIY shea butter conditioner. When you are ready to rinse the conditioner avoid hot and even warm water as it can strip hair of its natural oils leaving it dehydrated and you guessed it – frizzy! Instead, rinse with cool to cold water. As cold as you can take it! A cold water rinse closes cuticles and pores helping to seal moisture in your hair. Not to mention, a boost in shine. Utilize aloe vera gels’ ability to form a protective layer around hair to prevent moisture loss. Along with its’ power to smooth hair and keep the frizz down. After regularly washing your hair, pat dry with a towel, and apply a detangler. Comb through hair and apply a DIY anti-frizz spray. Style as usual and spritz in more as needed, depending on if you have curly, straight, or wavy hair. Related: Is Your Hair Conditioner Really Doing Its Job? Nothing makes hair shine like apple cider vinegar! But did you know it smooths frizzy hair too? Skip the typical shampoo and rinse your hair with apple cider vinegar. Let it stand for 30 seconds then rinse with cool to cold water. Follow up with your conditioner. P.S. If you’re not a fan of the apple cider vinegar scent use unflavored carbonated water such as S.Pellegrino sparkling natural mineral water instead. Shampoo and condition, as usual, then rinse with carbonated mineral water. It’s low pH levels works to reduce frizz and seal in moisture. Manage frizz with a deep conditioning overnight treatment. Loaded with vitamin E to prevent damage and coconut oil for intense moisturizing. This is one my favorites natural remedies for frizzy hair! In a small dish combine one tablespoon vitamin E oil and three tablespoons coconut oil. Work into your hair and scalp. Braid or twist into your hair. Then let the deep conditioning magic work overnight. Wash as usual in the morning. 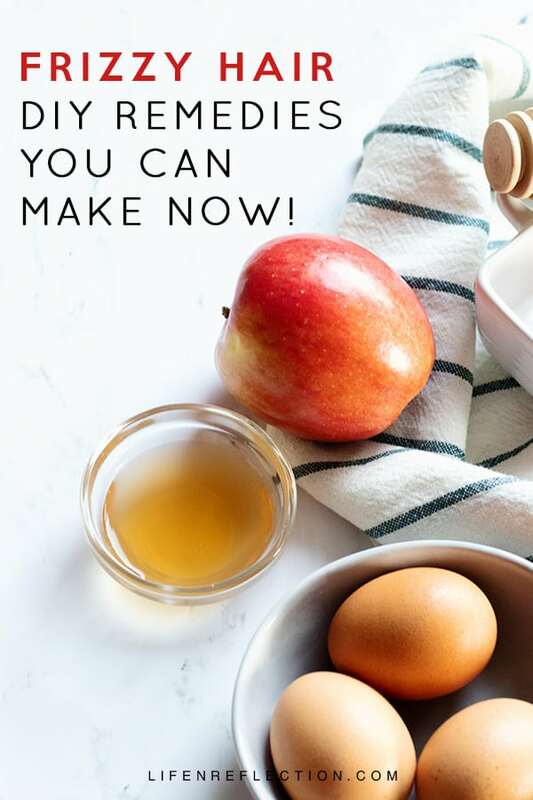 Remove excess oil and bacteria with the enzymes in egg whites, while nourishing hair with proteins and fats of egg yolk. In addition to the natural emollient abilities of olive oil for healthy, smooth hair. 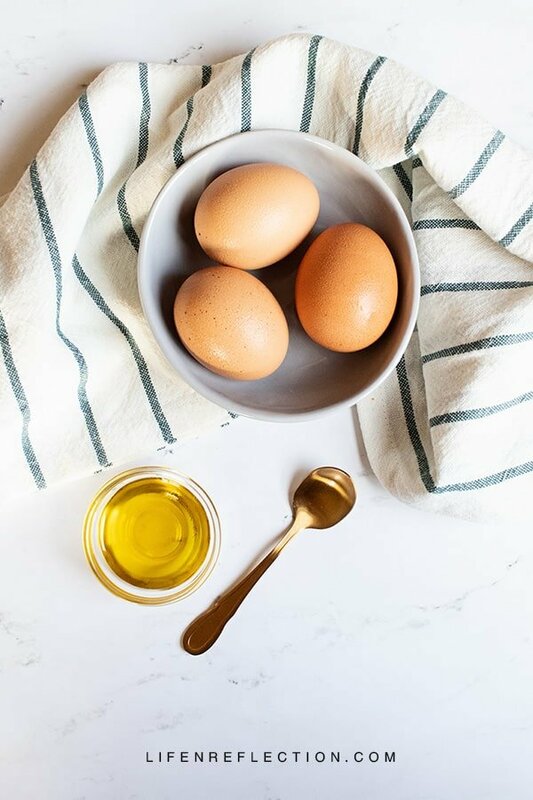 In a small dish using a whisk combine one egg and a tablespoon of olive oil. Apply egg and olive mixture to hair from bottom to top. Let stand for 20 to 30 minutes before washing as usual. Avoid shampoos with heavy chemicals that strip hair of its natural oils. Use natural oils to prevent damage and moisturize hair to beat the frizz! 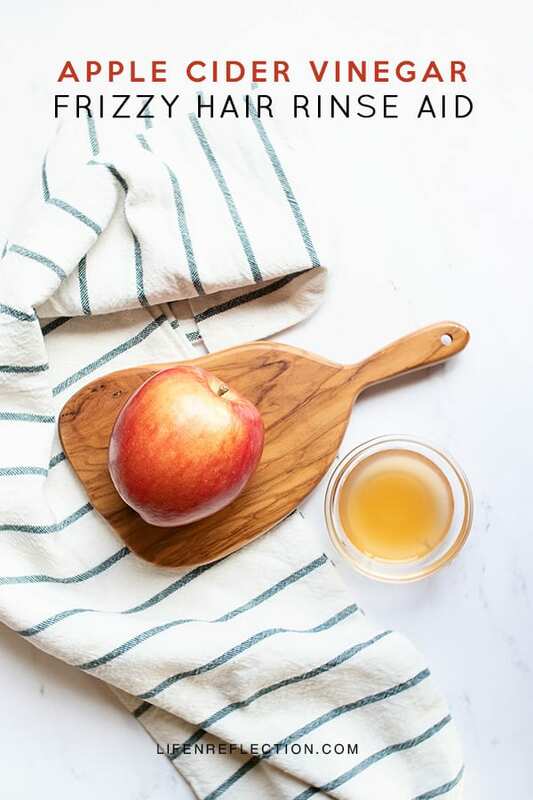 Opt for an apple cider vinegar or carbonated mineral water rinse to clarify and smooth hair cuticles. Turn the heat down when it’s time to rinse your hair. Use the cold water to close cuticles and seal in moisture. Don’t overwash your hair. Skip a day or two each week of shampooing with a DIY dry shampoo spray. Apply a hair mask, hot oil treatment, or deep conditioning treatment once to twice a week to nourish hair and combat frizz. When all else fails, use a styling aid such as a DIY Anti Frizz Spray. Scroll back up to the top to uncover how to tame frizzy hair naturally. Including hair masks and hot oil treatments made with ingredients from your kitchen. Pin this for later to try another easy natural frizzy hair home remedy above. Have you already tried one? Share your favorite in the comments below! *Rele, Aarti S., and R. B. Mohile. “Effect of mineral oil, sunflower oil, and coconut oil on prevention of hair damage.” Journal of cosmetic science 54, no. 2 (2002): 175-192. This is such a clever and organic way to get rid of that awful hair frizz! This will definitely come in handy on those humid days! Thanks, Jodie it certainly will! Of course, my hair would still be frizzy if hadn’t learned these techniques. Here’s to frizz-free hair!